Pushkar is one of the most exotic travel destinations in Rajasthan and has a rich heritage and culture. Pushkar is famous for its annual festival that’s held every year in the month of October-November. According to the Indian calendar, this festival embarks into Shukal Paksh Ekadasi in the month of Kartik. This festival is also called the Pushkar Camel Fair which is celebrated for 5 days. 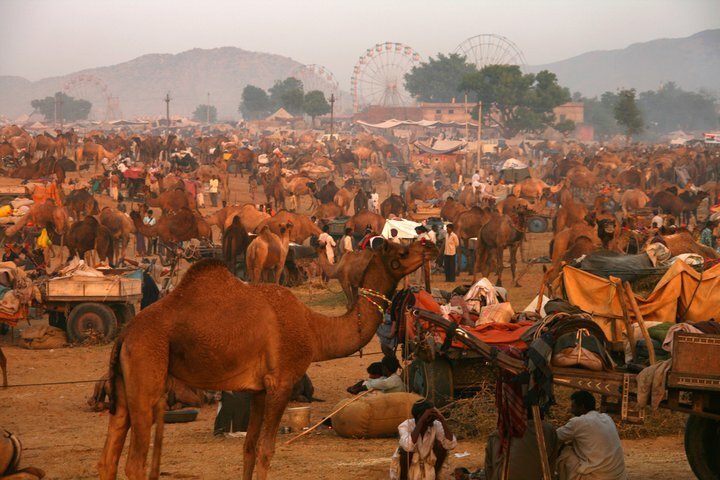 This five-day Pushkar camel fair is organized especially for the trading of cattle like camels, sheep, horses, cows, goats and so on. Camels are decorated with beautiful clothes and ornaments for public exhibits that walking over sparkling sand. Camel Fair is a wonderful experience of a lifetime. This annual festival is held in the month of October or November every year. During the fair, tourists get the opportunity to interact with the local women folk, who sell exquisite Rajasthani embroidered cloth, ornaments, jewelry, and pots. Folk dances, songs, and dramas are also organized for the entertainment of the tourists. The fair is also popular for trading of cattle. The rich and deep culture and tradition of Rajasthan is vividly displayed,during the Pushkar Fair. There are various places to see in Pushkar chief being the Brahma Temple, which is the only temple dedicated to Lord Brahma, all over India. Constructed in marble, the Brahma Temple is decorated with silver coins and a silver turtleon the floor of the temple. The temple enshrines a life size, four headed idol of Lord Brahma. Another must see place in the town is the Pushkar lake, which is considered to be one of the most holy sites for Hindus. According to legend, the lake was created by the lotus petals that fell from the hands of Lord Brahma. The beautiful Pushkar Lake is semi-circular in shape and is surrounded by 52 lovely ghats. The belief is that on the occasion of Kartik Poornima, a dip in the PushkarLake brings salvation to devotees. Savitri Temple is another must visit place, to see in Pushkar. The temple is dedicated to Savitri, who was one of Lord Brahma’s wives. Situated on a hilltop just behind the Brahma Temple, it offers a panoramic sight of the picturesque Pushkar Lake and exotic sand dunes which are close by. Another place to see in Pushkar is the Rangji or Rangnath Temple, which is famous for its magnificent south Indian style of architecture. Inside the temple, there is a large image of Lord Vishnu. One of the most holy temples in Pushkar that must be visited by tourists is the Varah Temple,which is dedicated to Lord Vishnu. Another important temple in Pushkar is the Apteshwar Temple, which dates back to the 12th century and is dedicated to Lord Shiva. Ajmer, Roopangarh, Kishangarh, Kuchaman, and Sambhar are some of the well-known excursions places at Pushkar. No one can complete excursion of Pushkar without a visiting sacred city of Ajmer. Located just 11 km away from Pushkar, Ajmer sports the famous Dargah of the KhwajaMoin-ud-din Chisti, a Sufi Saint. It is a shrine, which is worshipped by both Muslims and Hindus. Apart from that the other major tourist attractions in Ajmer include the Adhai Din kaJhonpra, Nasiyan Temple, and the Ana Sagar Lake. Another popular Pushkar excursion is the Roopangarh Fort, which was built in 1648 by Kishangarh‘sMaharaja Roop Singh. The Roopangarh fort is surrounded by beautiful architecture and centuries old traditions. Its royal armories, medieval stone granaries, formidable battlements, and jails are sure to leave the tourists mesmerized. Kishangarh is also one of the famous excursions from Pushkar, which is mainly renowned for its miniature paintings that are popularly known as BaniThani. Apart from paintings, the other main attractions of Kishangarh are its fort and the PhoolMahal Palace. Another famous Pushkar excursion is Kuchaman, which is well known for its splendid Kuchaman fort that was constructed by the Gujjar Pratihara dynasty. In Kuchaman is also located the LokDev Temple, which contains some stunningly beautiful paintings of Lok Devtas such as Baba Ram Dev, Sant Gogaji, Sant Kabir, Khawaja Moin-ud-din Chisti, and Guru Nanak. Sambhar Lake is another beautiful place, to go for an excursion near Pushkar. The lake has been declared, as a wetland of international importance and is also considered, to a bird watcher’s paradise. This is due to the fact that the lake is home, to around 140 types of birds, including land birds. Thus, it can be seen that apart from visiting, the various sights in Pushkar there are many places nearby, where tourists can go for excursions and enjoy. Being one of the five principal places of Hindu pilgrimages, Pushkar is considered to be a religious and cultural town. This is due to the fact that the only temple, which is dedicated to Lord Brahma named Jagat Pita Shri Brahma Temple, is located at Pushkar. In the town is also situated the Pushkar Lake, which people consider to be sacred and believe that taking dips in the holy water would bestow salvation upon them. Religion is an integral part of the lives of the people of Pushkar and the main religion that is practiced here is Hinduism. The essence of Pushkar culture is reflected in the language, traditions, and religious practices, followed by the people of the town. Pushkar culture is best seen and experienced during the Pushkar Fair, which is held at the time of Karthik Purnima, in November.The small town of Pushkar becomes colorful and vibrant during the days of the fair. The food, people, shops, sadhus, the whole atmosphere becomes an embodiment of Pushkar culture. The people of Pushkar dress in vibrant clothes, which helps to add another dimension to the fair as men can be seen dressed in kurta, dhoti and large turbans while the women folk wear ghagra and choli. 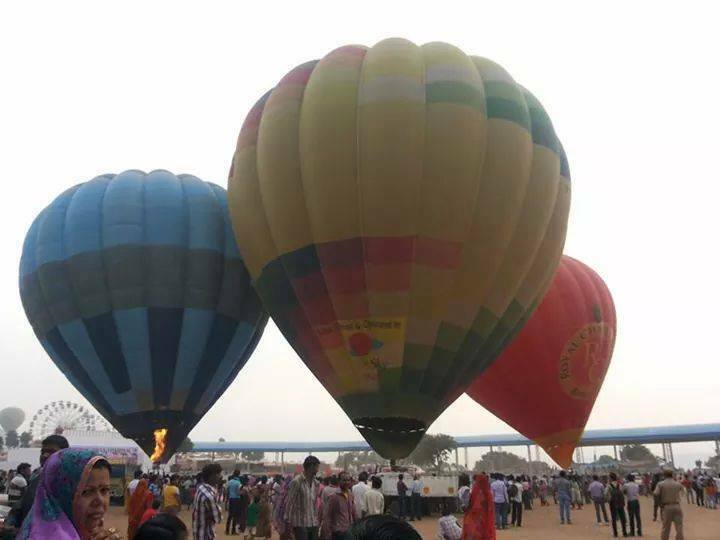 During the fair, Pushkar becomes the host of cultural activities as performers from all across the state, come to display their vibrant and vast cultural heritage. The artists leave the audiences, which come from all over the world, spell bound with their amazing skills. Be it the folk singers or fire dances, all of them have their own charm, which leaves the audience enthralled. Auctions, bazaars, sports, and music are highlight of the Pushkar Fair, where tourists can be seen buying some of the most exquisite handcrafted items of Rajasthan. The trading in camels is the highlight of the Pushkar Fair where horse, camel, and donkey race events are also held and greatly appreciated by the audience. Another favorite activity in the Pushkar Fair is body tattooing as many men and women can be seen getting tattoo on their hands or other parts of the body. Evenings at the Pushkar Fair are mesmerizing as the silent nights are pierced by the haunting ballads sung by artists in passionate tones. Folk dance, dramas, and skits are also organized for the entertainment of the tourists. Hence, Pushkar culture can best be seen by visiting the place and attending, the vibrant and colorful fair. Pushkar has extreme desert type weather as it has a sultry and hot climate. In Pushkar, one can experience great difference in the temperatures of day and night. During the summer, which extends from March to June, days are hot as the sun blazes with its full might. In complete contrast, nights even in summers are pretty cold. The average temperature ranges between 25° C minimum and 45° C maximum in summers approximately. Weather at Pushkar, during the winter season that extends from November to February is quite pleasant. In this season, the temperature ranges from minimum 8°C to maximum 22°C, approximately. Pushkar witnesses very littleRainfall, during the monsoon season that starts in the month of July and ends in September. In this season, average amount of rain falls and weather at Pushkar is generally very humid. It is better to avoid visiting the town during the rainy season. The best time to visit Pushkar is from October to March and if the trip is made in the month of November, then the colorful and vibrant Pushkar Fair is a must visit because it exhibits, the rich cultural heritage of the state of Rajasthan, in all its glory. The major tourists attractions located near Pushkar include Ajmer, Kishangarh, and Merta city. Ajmer located at a distance of 11 kms from Pushkar, is a major tourist destination because of its spiritual sites and eventful history. The city is a famous Muslim pilgrimage place for the Dargah or shrine of the Sufi Saint Khwaja Moinuddin Chishti. Other tourist attractions in Ajmer include the Taragarh Fort, Adhai Din KaJhonpda Temple, MaqbaraShaikh Husain Tomb, Anasagar Lake and Lake Foy Sagar. The sights and sounds of the city of Ajmer are sure to overwhelm and charm the senses of any tourist. Situated about 27 kms away from Ajmer is the city of Kishangarh, which is renowned for its miniature form of paintings, more popularly known as BaniThani. Kishangarh is said to be the only place in the world, where the temple of nine planets is located. Tourists can spend their time in the city, and visit these beautiful temple and buy beautiful paintings to take back home as souvenirs. Merta town is renowned for its bravura palaces and temples. Merta is situated in the Nagaur district of Rajasthan, around 50 kms from Pushkar. The famed Charbhuja Temple is located in Merta, which is associated with Meerabai, the well-known devotee of Lord Krishna. Thousands of pilgrims visit this temple each year, to pay their respect. There are a lot of hotels and resorts that are present in and around Puskhar. All the hotels are resorts are equipped with the most modern facilities and amenities and there are luxury as well as budget accommodation facilities. If you are interested in visiting Pushkar, then the best time is to visit between October and November, where it is time for the Pushkar fair. You can seek the help of any of the major travel tour operators in India to make your trip more memorable. This entry was posted in South India and tagged accommodation in pushkar, best time to visit pushkar, places to visit in pushkar, pushkar cattle fair, pushkar fair rajasthan, pushkar travel rajasthan, travel attractions in pushkar. Bookmark the permalink.